During a or challenge in which you control 2 or more unique participating characters, each of those characters gets +2 STR. The Road to Winterfell #22. How do I resolve Winterfell Castle and Plaza of Punishment? 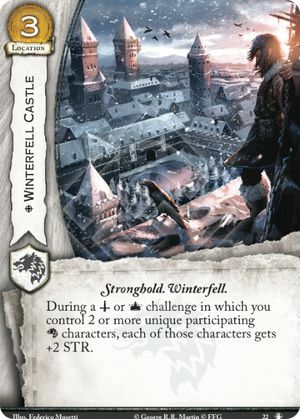 Winterfell Castle's effect lasts for the challenge - not the phase, but the particular challenge. Plaza of Punishment lasts for the entire phase. So let's say Plaza tags Arya with "-2 STR, kill if STR 0" as a reaction to winning, and then once any challenge bonuses are awarded, claim is satisfied, and keywords are resolved, Arya will lose the +2 STR from Winterfell Castle, have 0 STR, and be killed by Plaza.